Do we really need another recipe for chocolate cake besides our definitive Black Magic Cake, the first Recipephany? 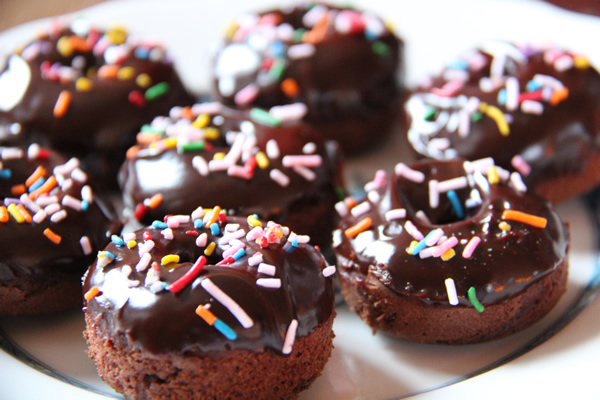 Yes, because we also need chocolate mini-donuts drenched in chocolate ganache. Black Magic makes ultra-moist full-sized cakes, but is doesn’t work so well for tiny sweets. With this recipephany, you can make these intensely chocolatey cuties in the time it takes to bake a batch of cookies. These mini-donuts have a lot going for them. Besides looking adorable on a dessert plate, they’re great for portion control. Instead of cutting a whopping slab of cake, you can pick up one of these and dispatch it in a couple of genteel bites. Then you can go back and pop two or five more and nobody will notice. If you’re thinking, “No, not another single-purpose kitchen gadget!” consider that a mini-donut pan can be quickly amortized. Especially when you get one (as I did) at T.J.Maxx for under $8. Plus, this recipe came with the pan. I sure got my money’s worth. Curiously, the recipe that came with the pan specified a “mini-muffin tin.” This can mean that: 1) The mini-donut pan company stole a mini-cupcake recipe and the proofreader didn’t catch the mistake, and if so, 2) You can use a mini-muffin tin if you don’t want to get a mini-donut pan. But the result won’t be nearly as cute. Preheat oven to 325°F. Combine flour, cocoa, baking powder and salt. In separate bowl mix eggs, sugar and vanilla until thick. Combine milk and butter. Alternately combine egg mixture and milk mixture with flour mixture and mix until smooth and soft. Spray pan lightly with cooking oil. Use half the batter, filling wells 2/3 full. Bake 8 minutes. Carefully remove. Repeat with rest of batter. Dip in chocolate ganache and top with jimmies if you want. Makes 24. Place chocolate chips, butter and corn syrup in 2-cup microwavable measuring cup. Microwave uncovered on medium (50%) 1 to 2 minutes or until chocolate can be stirred smooth. Add hot water until desired consistency.